Select your format based upon: 1) how you want to read your book, and 2) compatibility with your reading tool. To learn more about using Bookshare with your device, visit the Help Center. Here is an overview of the specialized formats that Bookshare offers its members with links that go to the Help Center for more information. Bookshare Web Reader - A customized reading tool for Bookshare members offering all the features of DAISY with a single click of the "Read Now" link. DAISY (Digital Accessible Information System) - A digital book file format. DAISY books from Bookshare are DAISY 3.0 text files that work with just about every type of access technology that reads text. Books that contain images will have the download option of ‘DAISY Text with Images’. BRF (Braille Refreshable Format) - Digital Braille for use with refreshable Braille devices and Braille embossers. MP3 (MPEG audio layer 3) - Provides audio only with no text. These books are created with a text-to-speech engine and spoken by Kendra, a high quality synthetic voice from Ivona. Any device that supports MP3 playback is compatible. DAISY Audio - Similar to the DAISY option above; however, this option uses MP3 files created with our text-to-speech engine that utilizes Ivonas Kendra voice. This format will work with Daisy Audio compatible players such as Victor Reader Stream and Read2Go. EPUB - A standard e-book format that can be read on many tools, such as iBooks, Readium or others. 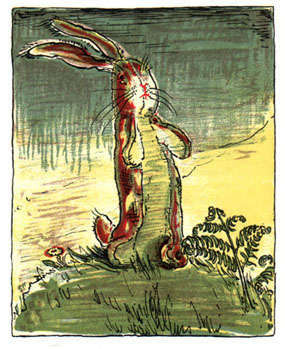 Originally published in 1922, The Velveteen Rabbit has delighted young readers for nearly a century. The story follows a young boy who’s given a stuffed rabbit as a Christmas gift. After the rabbit befriends other nursery toys, he comes to the realization that he wants to become a real rabbit. Eventually, the boy becomes ill and is relocated; his room is then disinfected and all the boy’s toys are thrown out, including the velveteen rabbit. The rabbit sheds a real tear causing a fairy to appear and turn him into a real rabbit. This edition includes full-color illustrations, with image descriptions,from the original illustrator, William Nicholson. Each image accompanies the text to enhance young readers’ experience and immerse them in this captivating story. Reprinted hundreds of times since its initial publication, The Velveteen Rabbit is a timeless children’s classic lets young readers experience the true magic of friendship, love, and being honest with oneself. In 2007, the book was named one of "Teachers’ Top 100 Books for Children” by the National Education Association. This book is in the public domain and is freely available to all.